As we all know, having a website is no longer a luxury or a ‘nice-to-have’. It has become a necessity to survive in today’s competitive business environment. Your website acts as your constant salesperson by being accessible online 24/7. To give your new website the best possible chance of success, it’s crucial that it has a professional, modern appearance that reflects your brand image well. We would like to introduce you to our latest designs! First up is our Travel & Tourism design. It is the ideal solution for travel agents and for individuals who own holiday apartments abroad. The Travel and Tourism Design lets you advertise your own holiday apartment, on your own terms, with no commission to pay to the facilitator (e.g. Airbnb)! The Multi-Page Travel and Tourism Design has no subpage limit and consists of a categories pages. 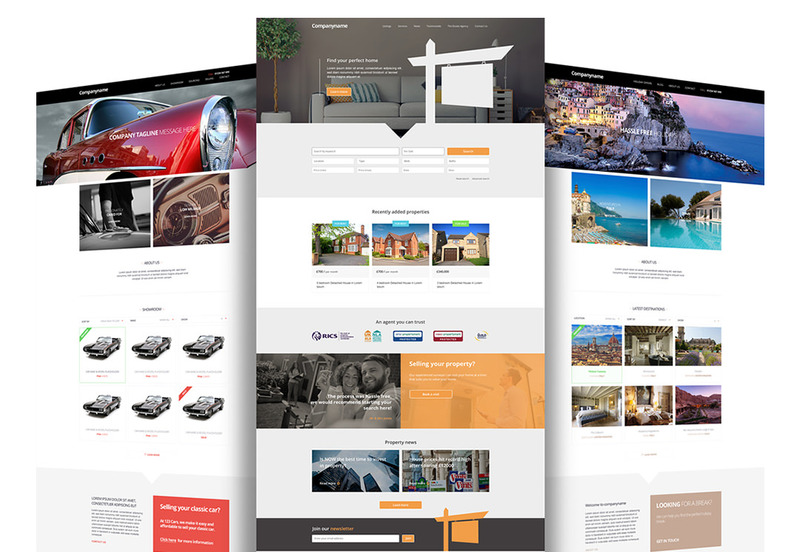 This makes it perfect for holiday lettings companies looking for a new website to advertise multiple listings across multiple locations or property types. Next is our Real Estate design, which is also multi-page website design. However, this is aimed towards Estate Agents, Private Landlords and Property Developers. The Real Estate design supports an unlimited number of properties which you can easily create with no technical expertise. These pages are also very easy to categorise, enabling a much better user experience on your new Real Estate/Property website. • Plugin to add/manage your property listings with no technical knowledge required. Finally, we have the Automotive design. This is a one-page design created to surplus the needs of Car companies. (Although can be used by several different industry sectors*). All the website content is displayed on one page enabling the user to scroll down or click on a heading which automatically navigates the user to the specific section. Due to the nature of the design, it’s advisable that you only have a maximum of 20 products/image added to the ‘Showroom’ section to avoid congestion. *Though all the Air Websites Designs are named after a specific business sector. We can customise each of the designs to be tailored to the customer’s needs. We have many clients with websites powered by the Air Websites platform who have opted for designs created for business sectors different to their own; demonstrating the true flexibility of all Air Websites designs! Check out our other cool website designs or, if you’re looking to build a larger more bespoke website, why not visit our parent company, Ascensor! We look forward to helping improve your online presence!